If you are not allowed to register, please get in touch with us to discuss available options suitable for you! Bodog is not offering any rakeback or cashback deal to their customers, but they are offering a SignUp Bonus up to $1000. Please check Bodog Bonus Details section for more info. New customers from Latin America countries will benefit from a 100% Bodog Welcome Bonus up to a total value of $1000. This $1000 is actually made of 8 bonuses whose values and requirements can be seen in the table below. The Bonus will be issued immediately as you reach each level, there is no Bodog bonus code required. Bodog Bonus is based on the cumulated deposits completed within 24 hours from the first amount you deposited. Bonus is valid for 30 days, so you have 1 month to release it. According to Bodog Points earning rate, you will receive on average 1 Bodog Poker Point for each $1.42 of rake you pay, but for the same amount of rake, you will earn more Points at the lower stakes than at the higher stakes. This means that Bodog Bonus has a lower rakeback equivalence if it is cleared at higher stakes. In Bodog you can't choose the cash tables. You can only choose the game type (Holdem / Omaha Hi / Omaha Hi-Lo), the limit (No Limit / Pot Limit / Fixed Limit) and the table type (2max / 6max / 9max) and you will be randomly seated to the tables with available seats. The maximum number of cash tables you can play at once is 4. This policy has both a positive and a negative impact, because it rejects some regular players who are want to know as many details as possible about the traffic, which increases the fish vs regular ratio, which attracts new professional players. This also makes bumhunting more difficult. 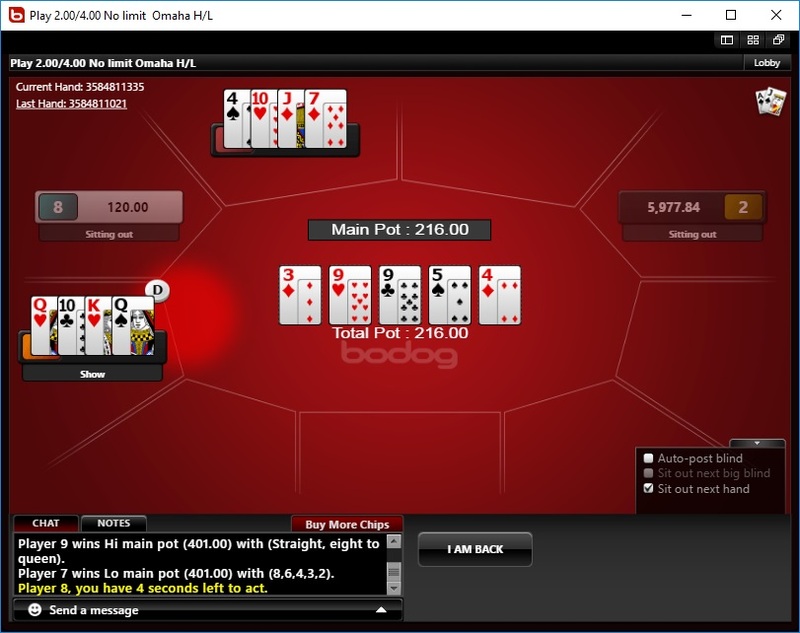 Bodog Poker is the 7th largest room from the players’ traffic point of view in 2018. The traffic peak is during evenings, EST time (GMT-4), when you will find tables up to 2K NL ($10/$20). The most action is at NLHE mid-stakes, with 20 tables up to 100 NL, 30 tables of 100 NL – 600 NL and 10 tables of 1K NL – 2K NL. The maximum stake for HU tables is 400 NL. The PLO traffic is a bit lower, mostly with 10 tables up to 100+ PLO, but in the evenings you will find tables up to 1000 PL ($5/$10). Also available is a fast poker version named Zone with tables up to 500 NL ($2/$5). All games are played in USD currency. Depending on the country of residence you are offered a different variety of deposit options. The withdrawal takes 1-3 days and must be made using the same method as the deposit. 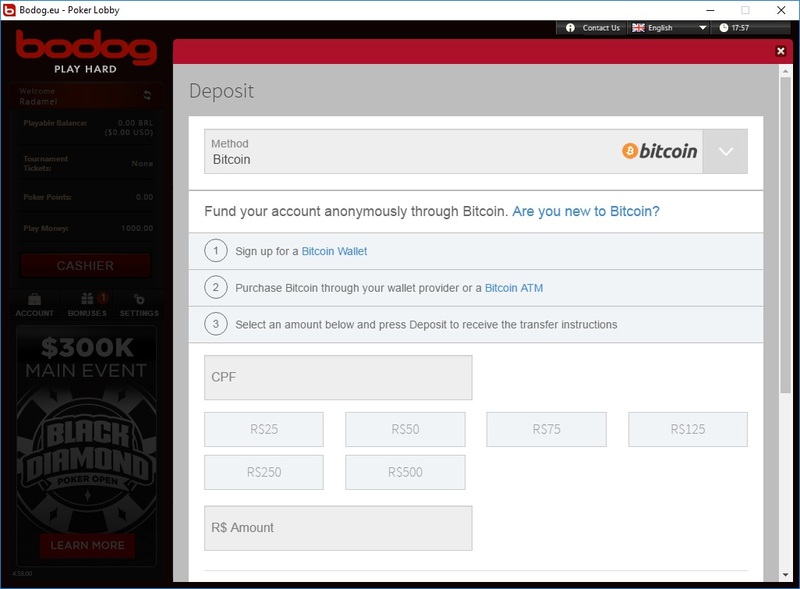 Bodog is one of the few poker rooms which understood the potential cryptocurrency has and they introduced Bitcoin and Bitcoin Cash payments. 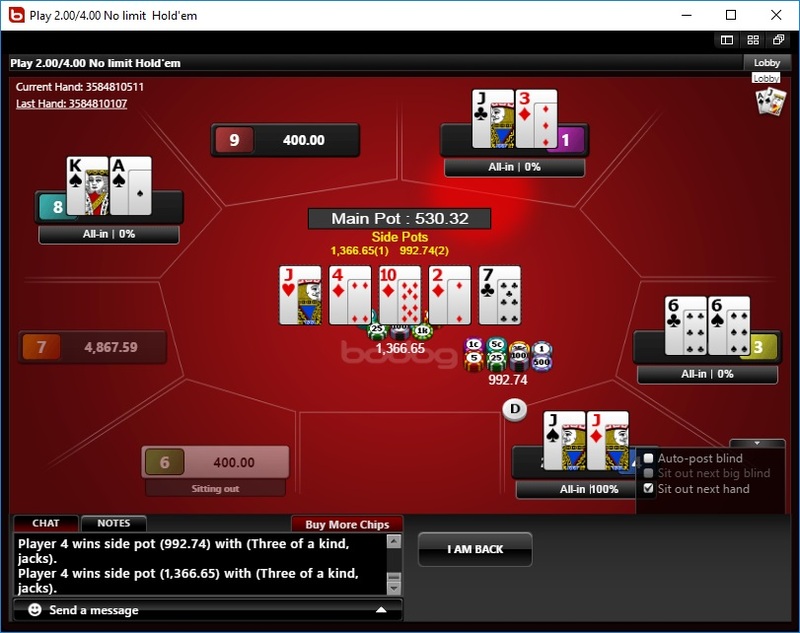 At Heads-Up tables (this does not include Heads-Up play from tables with more seats), Bodog is charging $0.01 rake for each $0.20 money in the pot, at all stakes and the rake is capped at $1. This means the rake charged by the room is between 2.5% and 5% of pot. In the table below, you have the rake structure for No Limit (NL) and Pot Limit (PL) games. In the table below you have the rake structure for Fixed Limit (FL) games. Although Bodog support team is doing a good job, you can also contact us on our Skype ID ITALY_PKR, for any information you need. The PaiWangLuo Network is composed of Bodog.eu, Bodog.com, Bovada, Bodog88, BodogIndia and Ignition branches. Each of them addresses a different segment of the online gaming market or different countries. 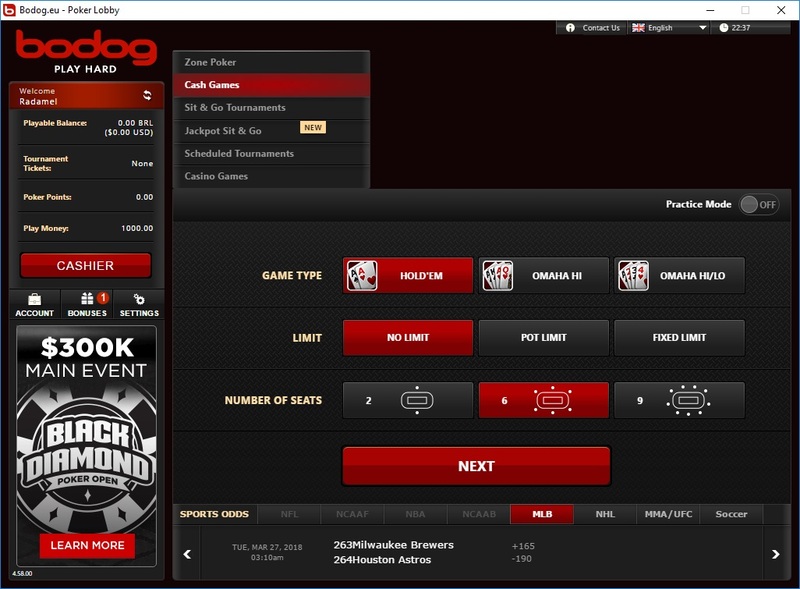 HoldemManager / PokerTracker are supported by Bodog Poker client, but a 3rd party hand grabber is required. Bodog is accepting customers from Canada and Latin America (LATAM). Bodog expanded to LATAM countries at the beginning of 2017 and they are currently accepting players from the following South America countries: Argentina, Brazil, Chile, Ecuador, Mexico, Peru and Venezuela. 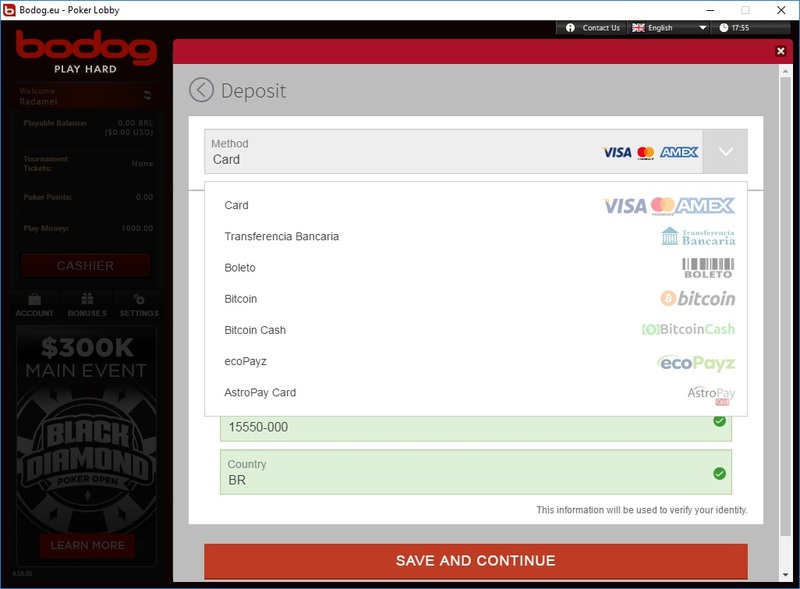 Players from the countries which are not allowed to register in Bodog Poker, but want to play in this room, are kindly asked to contact our support team.